Contact us directly for quantity discounts! Our highest gain, directional dual/multi band cell phone antenna - for 800/850MHz Cellular and 1900MHz PCS, 800/900MHz iDEN/Nextel/SMR, Euro/Asian standard 900MHz and 1800MHz, WCDMA 2.1GHz and the 2.5GHz WiFi band. The CMM-7-27 ceiling antenna combines ergonomic style with a sophisticated two element design supporting MiMo on 4G and diversity on 2G & 3G networks. 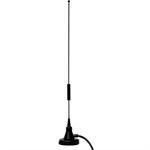 Low Profile Antenna improves performance in areas with low signal strength.